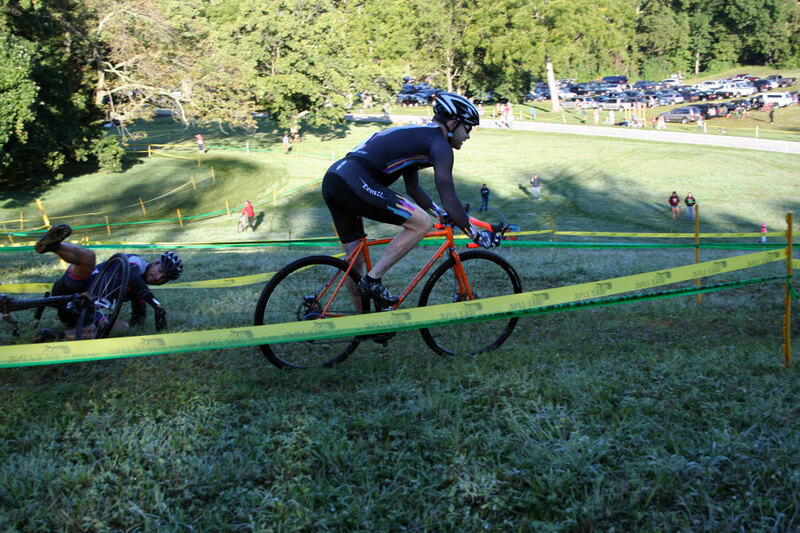 This is Part 2 of “My Introduction to Cyclocross”. Part 1: The Bike is here. I feel ready for this. I’ve practiced and tested for three days. I know what tire pressure I want to run and how I am going to approach the race. Sure, I’ve been practicing in the dry and it rained all day yesterday, but I can adapt. 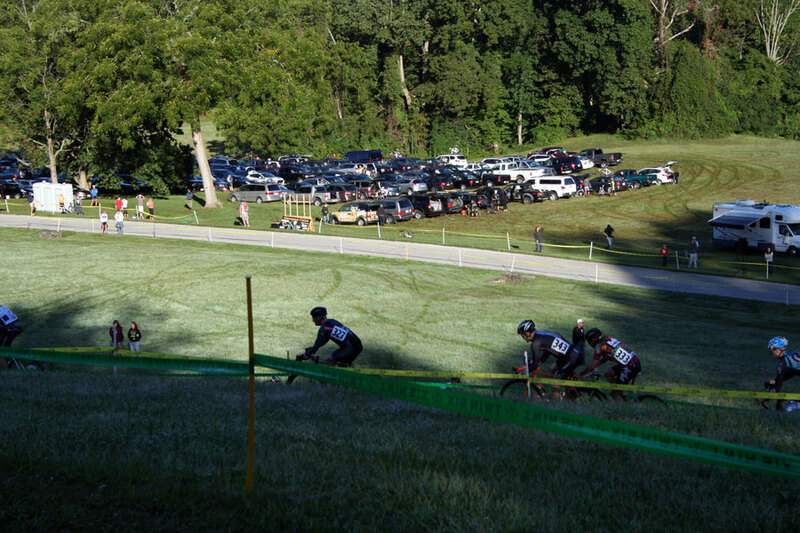 This is the closest cyclocross race to home I’m likely to get, it is my very first ever, and I’m excited. I’m running a little late this morning but Chris gets my bike off the roof and The Lovely Annalisa tends to the car and camera so I still have time for one pre-ride before the start. It is definitely different. Instead of dry grippy grass it is covered in dew, but it is solid underneath. The wooden pallets used to gap the trail to the pavement are super slippery, so I have to go straight over them instead of lean into the turns that they begin and end. The main runup that I could ride in the dry is definitely a runup now and there is running water through the rooted uphill section after it. No problem. I can deal. I line up several rows back, as befits a complete newcomer, but I’m not starting last which is lucky. The start is sort of anti-climactic, as it is downhill and there’s no room for me to really sprint anyway. It is just a sea of bikes. I hold my own, find a line near the inside, and hit the grass with speed. That speed quickly bleeds away, as riders cross wheels and go down around me. I stay clear as we turn right to go up the first steep hill. It is steep enough that some folks opt to run up it without even trying to ride it. Others try but fail and are forced to start running from a standstill. Several fall on their asses as they miss their footing while a few of us manage to thread our way through the carnage without putting a foot down. I know I made up 5 or 6 places right there, just by staying on my bike and cleaning that hill. 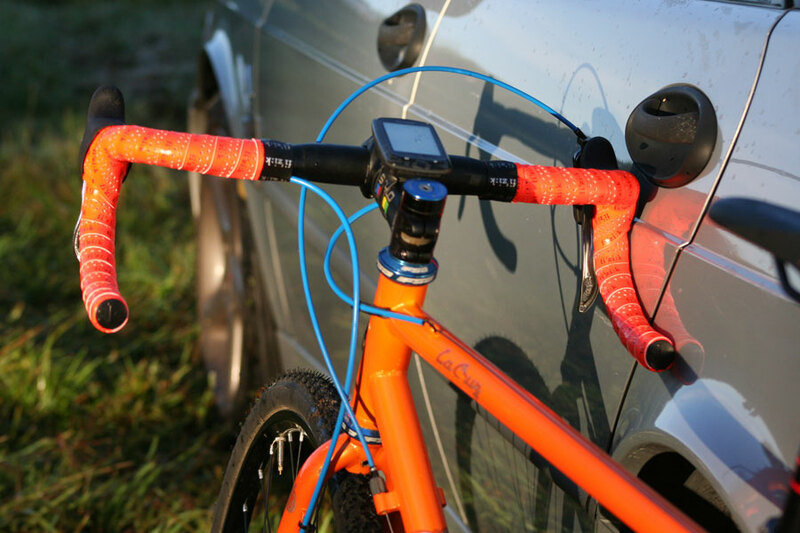 We wind our way around the famous Granogue tower and head into the off-camber downhill zig-zags. Here, I make up a few more places because I’ve already decided that the downhill and technical sections are my strong points, and I’m determined to stick with that plan. I see The Lovely Annalisa taking pictures by the side of the course and I race by her just as this dude next to me goes falling into the tape. I think “I bet she thinks I knocked him down” but I promise you, he was having his own personal crash party. I did NOT crash him. I’m big#343. Annalisa’s photo shows roughly the number of places I’d picked up by that point, just a short way into the race (bib numbers dictated start position). 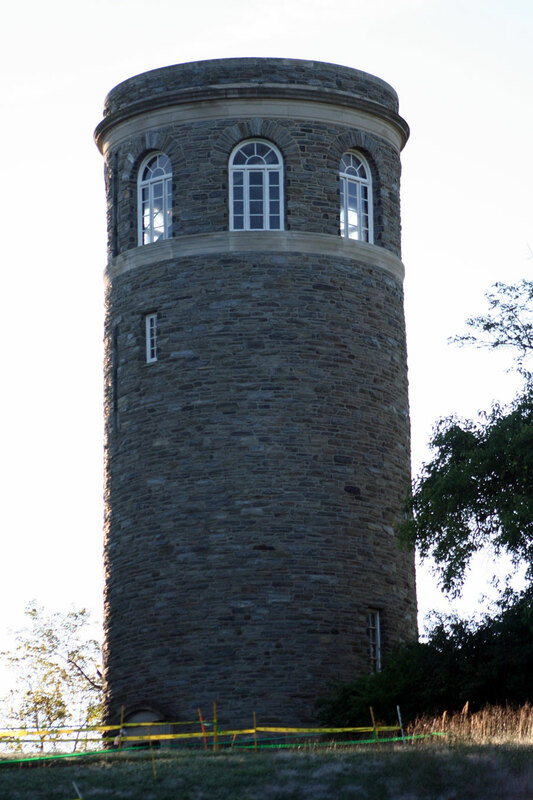 We wind our way over the back side of the hill, and climb through the woods. I’m making up places but also occasionally getting passed. I think the balance was in my favor though. 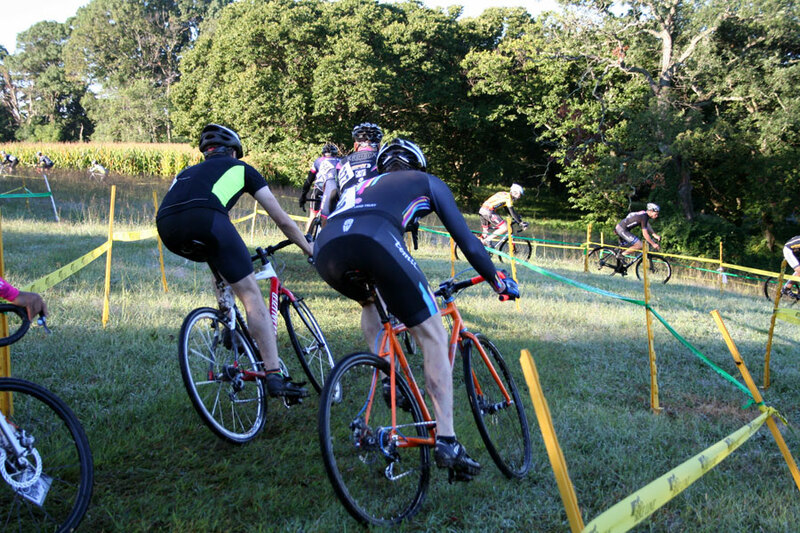 We cross the slippery wooden pallet/road transition and go into a zig-zag through some trees, down to one of the only flowing fast sections of the course. I see three people in the next 20 or so yards ahead of me and I resolve to pass them all before the run-up. I manage to get by all three by going harder into the fast turn and am clear of them as I enter the downhill into the woods and go over the bridge. Just after I cross the bridge and am looking up to the run-up I hear a PPSSHH-FTT-PPSSHH-FTT-PPSSHH-FTT sound as I puncture my front tire on something and it rolls around in the dirt spraying Stan’s sealant like a sticky white Catherine wheel. I remarked at my misfortune with an appropriate expletive, shoulder the bike, and run up the hill. It stops leaking, but there’s hardly any air left. I ride it carefully to the pits, which are thankfully not very far away. I get some assistance trying to add air, but as soon as we get near to 30psi, it sprays more sealant out the hole. I can see now, it is more of a cut than a hole, about 5mm long near the edge of the tread. I work on it with the mechanic long enough to see the entire field lap me. The mechanic gives up, makes the obligatory joke about running the rest with the bike on my shoulder, and then offers his condolences. It is about this time that I realize the pit is full not of mostly spare cyclocross bikes, as I had assumed it would be, but of mountain bikes. Doh! I have a mountain bike I could have brought. How stupid of me. I walk back to the car, put the bike on the roof, and go looking for a friend to commiserate with. I’m gutted about this. I mean, this hurts just as much as when the racecar breaks at one of my vintage races. It is one thing to try and fail. It is something else entirely to not get the opportunity to test myself due to a mechanical failure. It just leaves a massive hole and I’m not handling it well. All I can say is I’ll be back. I have unfinished business with this race. Thank you to Lisa and her co-organizers, volunteers, and officials. I didn’t get an opportunity to see how it really worked out because I left so early, but from what I saw it was a well run event. 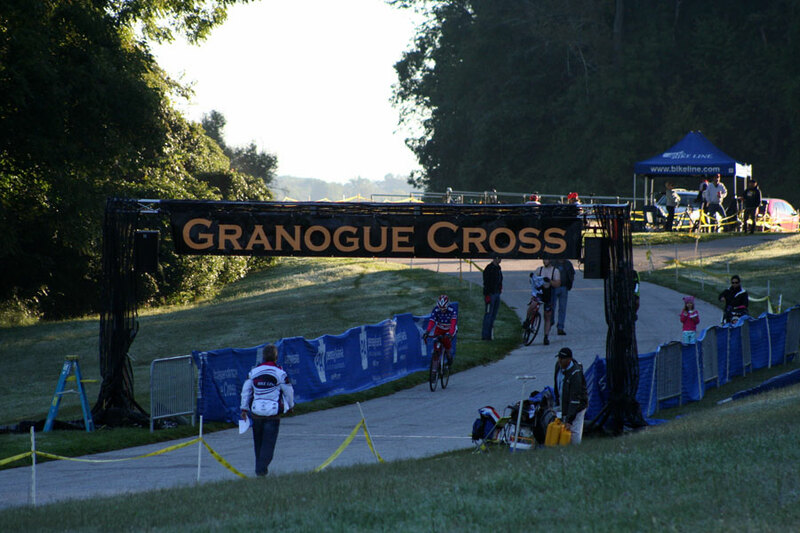 See you next year Granogue Cross.